Music, dance, poetry and art are but different dialects in the language of self expression. These dialects were in conversation and responded to three poems that speak about women’s lives, about choices that she needs to make, about aloneness and belonging, desire and passion, compromise, loss and solidarity. Music, dance, poetry and art conversed, they reacted, responded and spoke to each other to create a confluence of shared experience that strove to fulfill a desire for communality and fraternity on the 29th and 31st January 2015 at the Integral Space (Lower Parel) and Somaiya Centre for Lifelong Learning (Fort, Mumbai). Three poems by Anjali Purohit formed the starting point of this conversation – All Said and Done, The Secret and A Prelude to Passion. These poems were translated into Italian by Nuria Sala Grau and read by her at the Integral Space and by Clara at The Somaiya Centre. Noted musician and senior exponent of the Gwaloir Gharana, Neela Bhagwat responded through her bandishes in Hindi…Kehena tha who keh diya… , Halki si kehen, Kahan Akelapan and Bhor Bhayi Keheti Maina… . Italian musician Patrizia Mattioli composed electronic tracks for the three poems respectively. 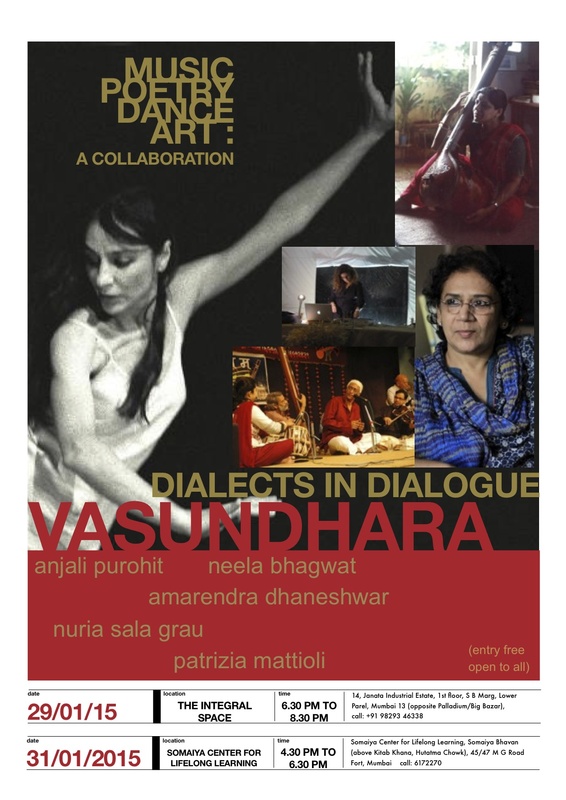 The Italian dancer Nuria Sala Grau spoke through contemporary dance as she danced to the tracks composed by Patrizia as also to the Hindustani classical bandish compositions sung by Neela Bhagwat. She also conversed with the three paintings – Time and Tide, Sisters and A Prelude to Passion painted by Anjali Purohit. Anjali Purohit is an artist and a writer based in Mumbai. She writes fiction and poetry and has been published in literary journals online and in print. Her book, Ragi Ragini, was published by Yoda Press in 2012. She has been exhibiting her paintings since 1995 and is especially interested in collaborative projects that bring together different arts to hold a dialogue on a shared issue. Amarendra Dhaneshwar is a Hindustani classical singer belonging to the Gwalior gharana. A pupil of the renowned singer Neela Bhagwat, he is also a contributor to leading English and Marathi newspapers. He has performed all over India and abroad and has contributed entries on Hindustani music to the Encyclopedia of India compiled by the American scholar Stanley Wolpert. Nuria Sala Grau is Spanish dancer and choreographer based in Milan (Italy), and has been performing professionally since 1989. She has studied classical ballet and Contemporary Art as well as Bharatnatyam. Her work focuses on dialogue and the integration of different cultures and languages as a way of living the dance. She has performed in European and international theaters. As we inch closer to the Kala Ghoda Arts Festival, here comes an update on Hope Street Poets, scheduled for Friday, 13th February 2015 at the David Sassoon Library Garden from 5:00 pm to 9:15 pm. Anjali Purohit will be discussing the history of reading circles and platforms for poetry at the Kala Ghoda Festival for its session THE LITERARY LIFE OF BOMBAY with Menka Shivdasani and Jane Bhandari @ the Artist’s Centre (Saturday, 7th Feb, 6.45 to 7.45pm). 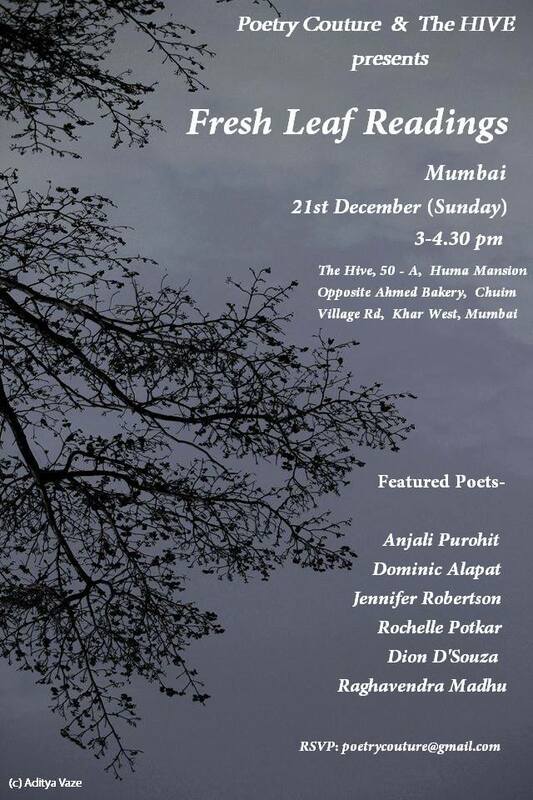 She will be speaking about the Cappuccino Readings initiative in a session dedicated to the history of reading circles and platforms for poetry in Bombay, as part of the Literature section of the Kala Ghoda Arts Festival 2015. This would be an occasion to discuss a major aspect of Bombay’s literary life and to voice a number of narratives that are usually confined to oral history but which deserve to be written about. 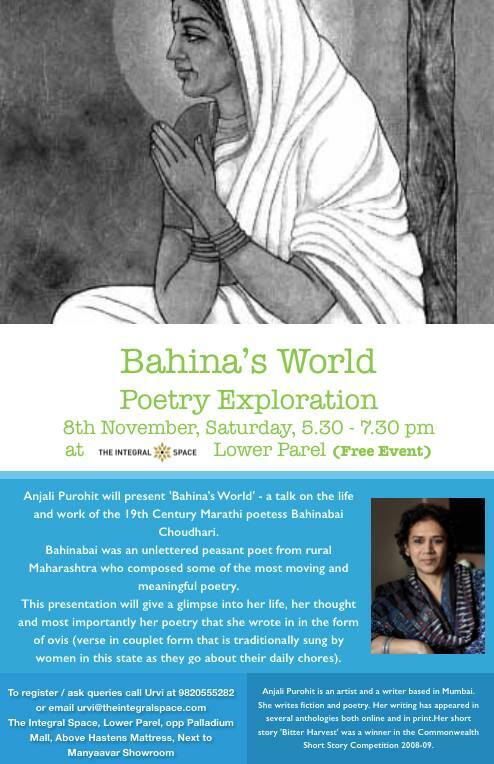 ‘Bahina’s World’ – a talk on the life and work of the 19th Century Marathi poetess Bahinabai Choudhari – presented by Anjali Purohit. Bahinabai was an unlettered peasant poet from rural Maharashtra who composed some of the most moving and meaningful poetry. This presentation will give a glimpse into her life, her thought and most importantly her poetry that she wrote in in the form of ovis (verse in couplet form that is traditionally sung by women in this state as they go about their daily chores). This is a Free, Open-to-All event.